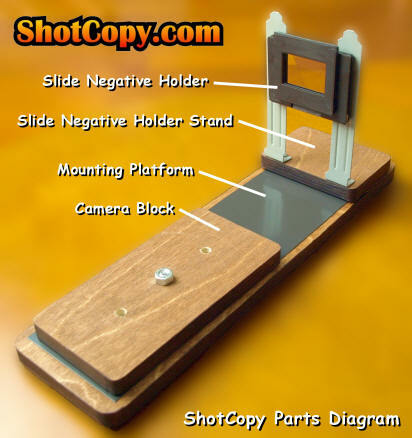 ShotCopy is a revolutionary new copy stand that allows you to mount your still or digital video/still camera (that can focus to within 1" of lens) onto a solid foundation for copying 35mm slides, negatives and prints up to 5 by 7 inches. ShotCopy's design makes it fast, simple and easy to use while maintaining a very small foot print on your desk top. It's not like the "good old days" when you needed a bulky copy stand with hot flood lights. Explore our site and learn for yourself how versatile and easy it is to convert your slides, negatives and prints using your digital camera. ShotCopy will save you time and money, compared to other methods, in converting your photographs into digital images. Save your photos from turning yellow and fading away. Use ShotCopy and your digital camera to convert your photos to digital images for others to enjoy and cherish. for all digital cameras that can focus close enough to capture a 35mm slide. Just mount your camera and start clicking away. Then download your digital pictures to your PC just like you normally do. If you choose you can even touch-up images with your favorite photo editing software. No cumbersome software package to learn. Just start clicking away and you will be done in no time. Go anywhere with ShotCopy and your digital camera with no PC required. Visit your family members and capture images that you don't have in your collection. Then share them by the Internet or burn a CD or DVD and make copies for everybody so each of you have a copy of all the pictures you have among yourselves of your family's history. Precious images where the color has faded on slides and color negatives can be restored back to life as excellent black & white images. Sometimes, depending on content, you may find you like the b/w image better than color. 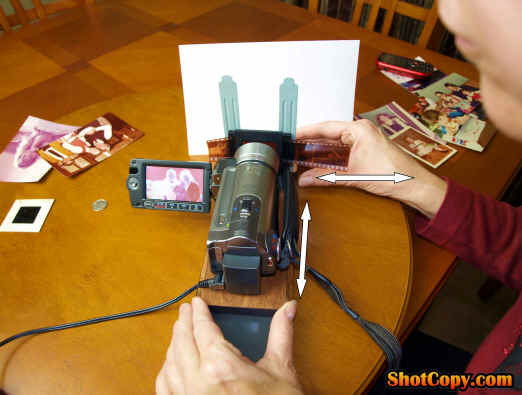 ShotCopy works by holding a specially designed Slide Negative Holder in just the right position in front of a digital camera lens so the image can be captured with a click of the shutter. A white reflector behind the image allows illumination of the slide or negative from behind. It is simple, quick and it works great!!! ShotCopy is handcrafted from Baltic Burch, coated galvanized steel and durable plastic for many years of trouble-free, reliable service. 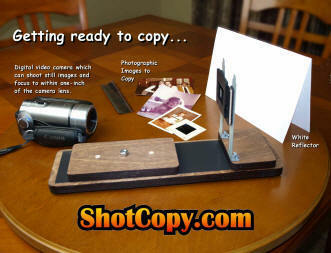 ShotCopy's ingenious use of magnetic pads makes it easy to make quick image changes while copying. Plus, its compactness takes very little space on the desktop. With ShotCopy and your digital camcorder (which can focus to within 1" of the camera lens) you don't need a PC around during image capture. After your done copying you can download the pictures to your PC for image editing and touch-up. Once you have your photographic memories on your PC you open up a whole new realm of possibilities to share photographic memories with family, friends and the world! NOTE: ShotCopy also includes 4 magnetic pins which are not shown. ShotCopy is easy to use because it requires no fancy clamping mechanisms to hold the images in place for copying. 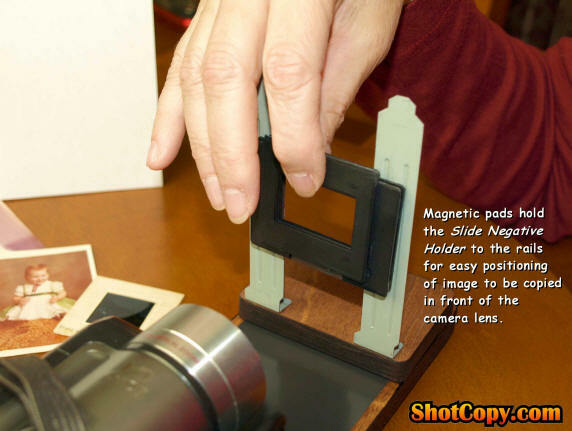 It uses the unique properties of magnetism to position slides, negatives and prints in the correct position for copying by a digital camera that can focus to within one-inch of the camera lens. Due to ShotCopy's design it will work with most digital cameras that can focus to within one-inch of the camera lens. We would like to say all digital cameras but it would be impractical for us to test ShotCopy with every camera made. This is why it's important for you to test your digital camera before buying your very own ShotCopy. We have found through our extensive experience that most digital video camcorders (with still picture capture capability) can easily focus to within 1" of the camera lens. We highly recommend you use or acquire a video camcorder which has both digital still and video camera capability built into one device. Almost all camcorders can focus to well within one-inch of the camera lens without the need for supplemental lens attachments or use of a detachable macro-lenses. The camcorders sold today no long use videotape, since it's been replaced by flash-drives or SD chips (as shown below) which provides faster capture and stores in file formats similar to what's on your PC for still digital pictures and video. Example of camcorders today which capture both stills and video on SD memory chips without videotape or plastic disk storage. The main point to remember before purchasing ShotCopy is to test your digital camera with a 35mm slide to see if it can focus close enough so that the slide image fills the camera's viewfinder. This camera feature is required to copy slides and negatives. During testing make sure your camera's zoom-lens is set for wide angle viewing. It is interesting to note that on some older cameras there may be some image barreling. This is when the edges of the four sides of the slide or negative looks like its bending inward. If your camera is having trouble focusing at this distance try a set of supplemental close-up lenses for your camera. In support of our great product, here are a few user testimonials that typify the types of comments we are receiving about ShotCopy. Al uses a digital camcorder with ShotCopy to capture images. After completing transfer of photographs, slides & negatives to the PC he uses photo editing software to clean-up and prepare for distribution to family, friends and associates via email and eventual publication to an Internet website. How I transfer slides to PC? I have already copied over a 1000 slides using ShotCopy and I wanted to tell you about all the time I have saved and how easy it was to use versus my scanner. Thank you for a great product that really does the job quickly using my digital camera. Bought your ShotCopy and just got the SnapMount for my iPhone. It is amazing how I can use my iPhone to capture my family pictures. I even messaged a few from my iPhone as I was copying. My sisters and brother loved it! About three months ago I bought your ShotCopy. Just wanted to drop you a line and let you know how I love my ShotCopy. It's absolutely genius how simple it is to use. Especially using magnetics to hold everything in place once everything is setup for copying. Since I only use one camera for copying, I marked the position of the camera and copy stand on the base, so when I setup again I'm ready even faster. I bought a new camera for myself for Xmas. I wanted to buy ShotCopy before but found out my old digital still camera would not work. So this year I killed two birds with one stone. I bought myself a hi-def digital still and video camera all rolled up into one device. The camera focuses so close I can take a snapshot or video of an ant running around. Looking forward to receiving my order! I have been looking and evaluating different products online for copying slides. I have even tried a few with disappointing results. I must say your product has worked perfect for me. Especially with my new digital video camera. It was so simple to use once I got it setup and it was fast. Just wanted to thank you for a brilliant product! This is so easy to use compared to other things I have tried. I especially like not having to load and unload trays. What a time saver. When I first got ShotCopy I was a little concerned how everything was held in place. It was a stroke of genius to use magnets to allow easy setup and ease of use. I've been showing my old pictures around to my family and friends using your Shotcopy device and they were amazed they were copied using my digital camera! I will be sure to tell others about your great product. I was skeptical at first. It seemed to simple and to easy to be true. But I felt I had little to lose by giving it a try. My other alternative was an expensive slide/negative scanner. I had already tried a high end scanner. It was taking forever to scan over 100 slides. Plus the results were not very good. With ShotCopy and my new digital camera I finished the project in less than a day! Thanks for saving me money, time with a great product that made the job easy. We want you to be completely satisfied with your ShotCopy purchase so you will tell your friends about our great product. 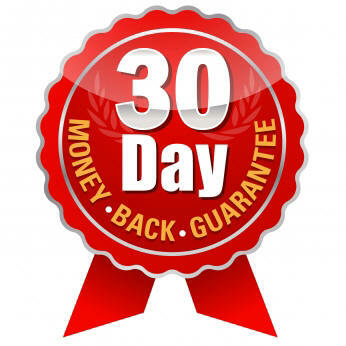 We are so confident that you are going to love ShotCopy once you start to use it; we offer a "30 Day Money Back Guarantee" starting the day the order arrives at your ship-to address. If for any reason your are not completely satisfied with your ShotCopy purchase, return it within 30 days of receipt for a full refund of your purchase price (less shipping & handling). It's that simple!